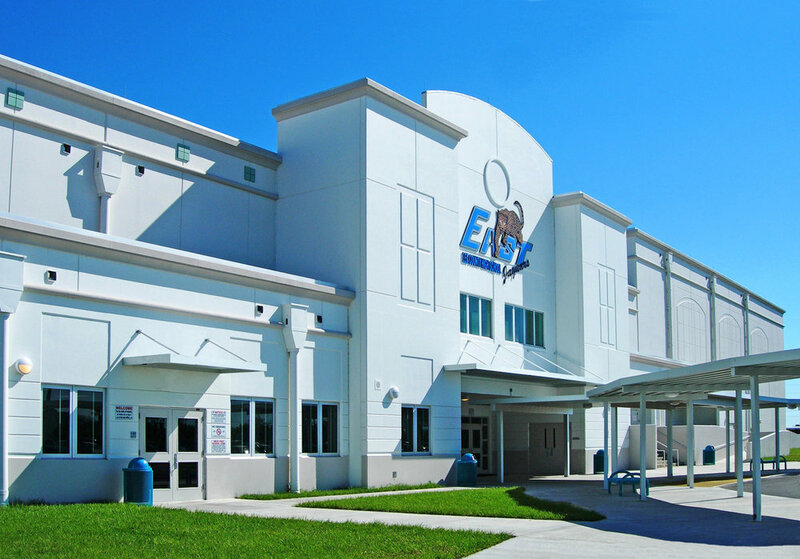 East Lee County High School — Song + Associates, Inc. This successful prototype design, originally used for Ida S. Baker High School, is an efficient two-story educational facility that has the ability to adapt to any type of site conditions and design preferences. This unique prototype design maintains its uniqueness through the use of an energizing color scheme and a detailed exterior facade unlike any other school. The East Lee County High School has the capacity to accommodate 2,000 students as well as extensive community use outside of the class schedule. In addition, this facility serves as a Florida State mandated special needs shelter. The access points along the perimeter of the school are designed with safety and security in mind; allowing for faculty to better monitor student traffic and prevent outsiders from entering without proper authorization.